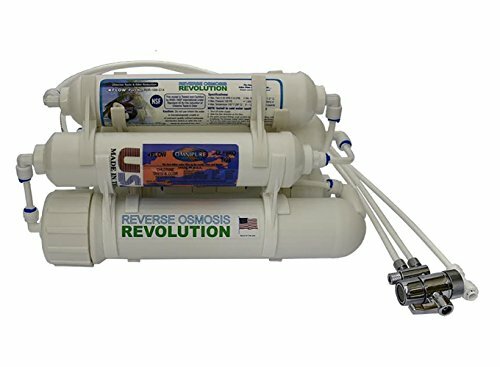 The Countertop Portable Universal reverse osmosis system is one of the smallest filtering systems you’ll be able to find on the market today. With a simple installation process, this unit will be ready to use minutes after you take it out of the box. In the following article, we take a closer look at this filtration system’s efficiency, filters, and installation, and we reveal the pros and cons of using it. Unlike most of the other RO systems which are designed to fit under a sink, this model is specially designed to take up a small amount of space, so you can install it directly on your counter, or you can even hang it from the counter above your sink so it won’t take up any space at all. This makes this unit the perfect choice for people who are often moving from one apartment to another, people who are living in RVs, trailers, or people who like having a clean aquarium. Despite its small dimensions, this RO system has efficient filters which are able to block most of the contaminants in your water source. Unlike the other RO systems, this one doesn’t need an additional faucet. It will simply attach to the existing faucet and it will filter the water when you want it to. Despite its small size and unusual installation, this is an efficient unit. 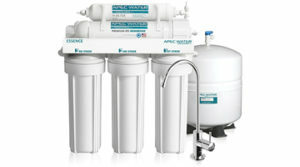 The RO system has a wastewater pure water ratio of 2.6:1. This is considered to be a very good ratio, thus an efficient unit. Many reverse osmosis systems can waste up to 20 gallons of water for a gallon of filtered one, and they are considered efficient if the wastewater filtered water ratio is smaller or equal to 4:1. Because you don’t have to install a wastewater line directly into a drain will allow you to see how much water is wasted. This might seem like a large quantity of water to throw down the drain, but it’s actually less than what other models waste. This reverse osmosis system delivers surprisingly good results for a model you just hook onto your kitchen faucet. It doesn’t have a separate tank to collect water, and installing it is actually done in seconds. Yet, despite these things, the filters are capable of blocking most of the contaminants in your water source. This model uses a 5-step filtration process. The first filter will block out any sediment larger than 5 microns. This means that rust, debris, dust, and many other contaminants are blocked at this point. The second filter stops most volatile organic compounds (VOCs), chemicals, chlorine, and any odd coloring, taste, and smell. The third filter is the reverse osmosis membrane. This membrane will block 95-99% of the total dissolved solids present in the water, along with any remaining chemicals, bacteria, viruses, heavy metals and other contaminants. The fourth and fifth filters will improve the quality and taste of the water, making it better suited for human consumption. Unlike the other reverse osmosis systems, this unit doesn’t need any installation. You won’t have to take out your toolbox when this filtering system arrives at your home. You might need an adjustable wrench, but only if your sink’s aerator is too tightly screwed for you to remove it by hand. You just have to attach the filter to your existing faucet using the chromed metal diverter. If your faucet has a female thread, you will have to attach the adapter that comes in the box. For male threads, the diverter can be attached without using the adapter. Make sure you don’t use any Teflon tape when you install the diverter. If you apply Teflon tape before screwing in the diverter, the installation will definitely leak. Just make sure the O-ring inserts are in place before screwing the diverter. The filter will produce two water flows. The first one will exit through the diverter, and it’s the pure water. The water exiting the white plastic valve is wastewater, and you should drain it or use it to water your plants. Keep in mind you have to leave the RO system running for a whole hour the first time you use it. Do not drink this water, as the filters are not fully activated. Only after the filter worked for one hour should you taste the water. Small And Portable – This unit is small enough to keep mounted on your kitchen counter. In fact, the filter is so small, you can even take it with you when you travel. Efficient Filters – The filters used by this RO system are very good. They will block most of the contaminants in your water source. No Tank – This unit doesn’t come with a tank. You have to fill plastic recipients if you want to collect water. This is a disadvantage because you won’t have a constant source of pure water.